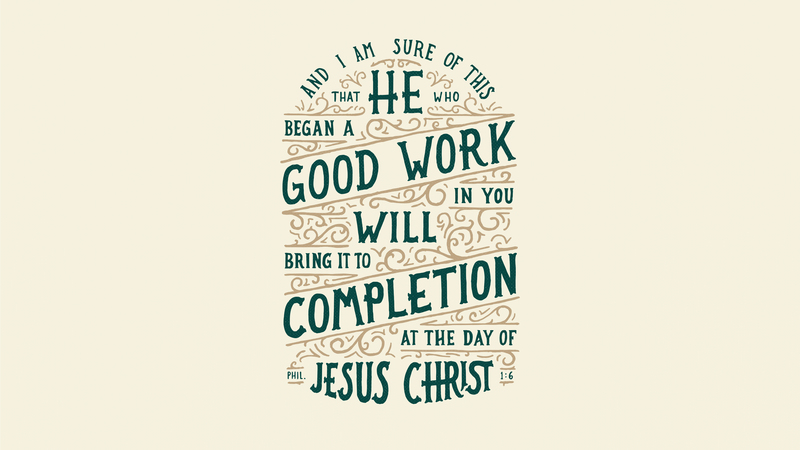 He who began a good work in you — saving you and beginning to make you more like Jesus — he will complete that work. 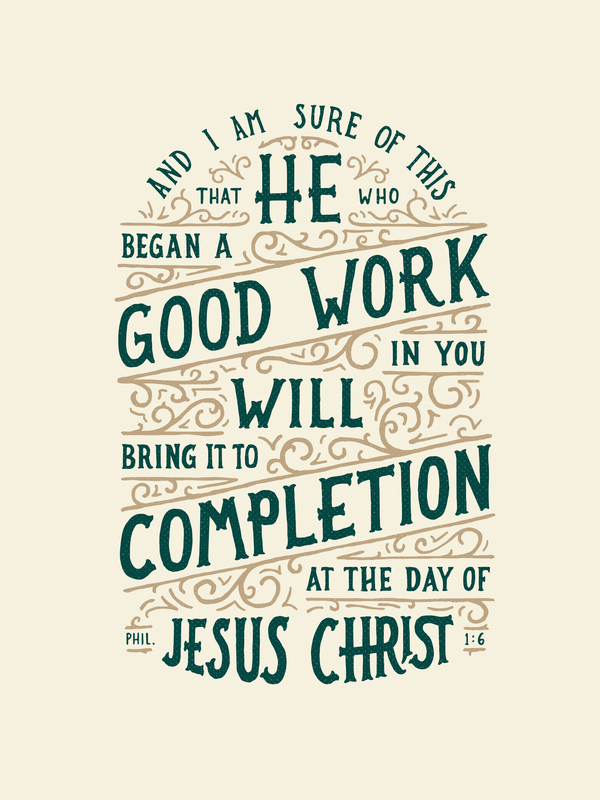 If you are in Christ and have known this promise, you’ve known it is precious. “I am sure of this, that he who began a good work in you will bring it to completion at the day of Jesus Christ” (Philippians 1:6). God, by his unrivaled, infinite power, will one day remedy everything wrong about you. Now, you are counted perfect through faith in Jesus. Then, you will be presented perfect — no sin, no shame, no guilt, no doubt, no fear — nothing broken about you. The promise is a safe word when Satan’s lies try to seduce or shame us. It’s a strong word in the midst of temptation. It’s a hopeful word when we’re confronted with our own sin and need. It’s an unwavering word when all around us seems shaky and unsure. It’s a comforting word in weakness or pain. It’s an inspiring word when we need motivation to press on in the faith, working out our salvation. Philippians 1:6 assures us of how it all will end for us, and that our end will be good, beautiful, and holy before our God. [But] we don’t close our eyes and simply hope for the day of perfection. No, we open our eyes wider than ever, relying on God’s promise, looking for opportunities to learn more about him and his word, and watching for ways to love. God’s reshaping, polishing, finishing work will be happening as we are loving. God is completing us when we love our spouses and our children, when we love our neighbors and co-workers, when we love our life-long friends and the strangers we’ll probably never see again. For sure, there will be a glorious, full, after-death removal of all sin (Revelation 21:4; Revelation 21:27). No one will die without some sin still to be forgiven and washed away, however much glorious progress they made along the way (1 John 1:8). But Paul’s hope and joy in Philippians 1:6 wasn’t penned merely to be a wait-and-see prayer, but a press-on-in-the-work prayer for the spread of the gospel — first in their own hearts and holiness, and then to more and more who have not yet heard or embraced the good news. God will be completing what he’s been doing among us, in each of us and through us to the world around us (Isaiah 55:11) — all through love, a love formed and carried along by the truth. Don’t lose heart. Don’t give up. Don’t doubt the passion and ability of God to fulfill the plans of God for you and for the world. Set yourself to love more and more whoever God has put in front of you, and know that he will be preparing you to stand in front of him.